There are several things that can be done to prepare for an earthquake. Attaching your water heater to the wall is a good idea. There are two main reasons to strap your water heater so it does not get shaken about and fall down. 1. You don’t want to have fire danger caused by broken gas lines that go to your water heater. When it falls, the gas line could break away from the water heater or from the wall and that could cause a fire. 2. One of the things that you want to have if the earthquake is bad enough to cut off or pollute your water supply is drinkable water. If the water heater falls, it is most likely that the water will all drain out and you will no longer have the 30 gallons or more of drinkable water that is inside of the water heater. All that it takes to strap your water heater to the wall is about 10 feet of a metal trap tape called plumber’s tape. First you need to find something to attach the strap to on the wall behind and to the side of the water heater so that the strap ends up even with the top of the top ring (cap) of the water heater. If the wall is a sheetrock and stud wall then one end of the strap can be attached with screws through the sheetrock into the stud. If it is a block or concrete wall it becomes necessary to attached to the wall with a tool called a “Ram Set” which attaches to the wall with a concrete nail that is “shot” into the wall with a black powder charge like a 22 blank charge. The next thing is to take two screws out of the top ring (the cap) of the water heater so the strap can be attached to the ring. Now wrap the strap from the wall all the way around the water heater, one full time so it crosses over itself, and then to the other side of the water heater and attach it to the wall. Look around your house and see if you have any tall shelves or cabinets. 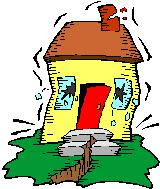 Anything that is over 4 or 5 feet tall, or seems like a little shake could knock it down, should be attached to the wall so that it does not fall down during an earthquake. The things to look for are bookshelves as they are heavy and could hurt someone if they were to fall down on them. Another thing to look for are shelves that have glass items on or in them or that are made with glass doors. General Contractor . . . my work is mainly in Glendale, Eagle Rock, Pasadena, Burbank, Tujunga, Studio City, Chatsworth and similar areas. License #978915. 30 years in the building trades.